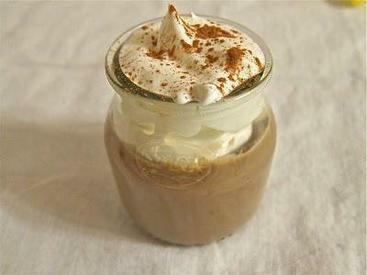 f you love coffee like I do, this Café Au Lait pudding is for you. It is tantalizing and creamy. Not cloyingly sweet like some puddings tend to be, this pudding is just dreamy. The delicate coffee flavors linger on the palate. Milky, rich and understated, it is everything a pudding should be. Whisk together milk, coffee granules, cornstarch, 1/4 cup sugar, and a small pinch of salt in a heavy medium saucepan. Bring to a boil over medium heat, stirring occasionally, then boil 1 minute, stirring constantly. Transfer to a metal bowl set in an ice bath and cool, stirring often, about 10 minutes. Pour into cups or ramekins and chill, uncovered, 20 minutes. Beat cream with vanilla and remaining 2 tablespoon sugar using an electric mixer just until soft peaks form. Spoon whipped cream onto puddings and dust cream lightly with cinnamon.